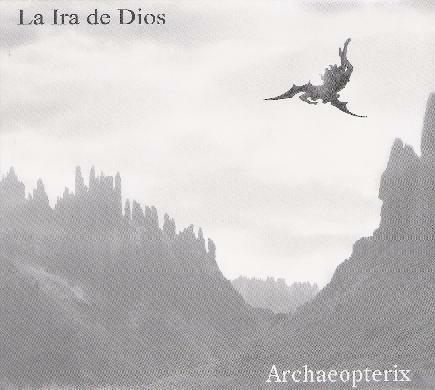 La Ira de Dios - "Archaeopterix"
La Ira de Dios' debut album (see AI #32) was near the top of my 2005 favorites, being a monstrous set of molten rocking spaced out acid psychedelia. At that time this Peruvian powerhouse were a trio. But on their new album the band have expanded to a quartet, and it appears that guitarist/vocalist Chino Burga is the only member remaining from the first album. Archaeopterix is once again on the great Nasoni label, in CD and 2-LP versions, and vinyl junkies should note that the LP includes a 24 minute bonus track not on the CD. "Al Viento" starts off similar to "El Llamado"… just jamming along at a slow stoned pace, but with a considerably more mellow, mind-bending feel. But you know things are going to eventually heat up, and sure enough, right around the 5 minute mark the band bust out. They don't speed up…. no, the music remains at a sloooow stoner pace, though the volume goes up and Chino solos against sludgy power chords and a crushing Black Sabbath like rhythm section. But this 17 minute track transitions through a number of moods and themes. The band recede into calm, allowing a fresh storm to brew, only to break out and really start to rock out in space. Chino goes wild on guitar, the alien electronics are flying and the bass and drums are flailing about madly. Man, these guys really handle the long tracks well. "Nave Fénix" is a heavy psychedelic space rock jam that keeps things rockin' hard until the CD's closing 24 minute track, "Cordillera". The track starts off with several minutes of trippy acoustic guitar, very similar to Lamp of the Universe. But soon the band blast off and we're rockin' again. But on this track the band spend a lot of time developing quieter, even dreamy segments. Very different from the rest of the album, with gorgeous melodies that just swept me away. Outstanding thematic shifts and, again, a really solid and well played lengthy track. And for those of you who still have turntables and want to splurge for the vinyl set we've got an additional side long 24 minute track - "Qanavillonqui". It starts off in deep space acid jam land as the band do the kind of tension building introductory build up that they've demonstrated such excellence with. Eventually they settle into a kind of Hawkwind "Shouldn't Do That" styled rocking groove, but with Chino's distinct acid laced guitar style. Damn, this may well be the best track of the set, and it's only on the vinyl edition. Total jamming SPACE ROCK!! Overall, Archaeopterix is a hell of a ride. These guys bring together space rock and hard acid psychedelia like no band I've heard in recent years. If you liked their first album you'll flip over this one. HIGHEST recommendation! For more information you can visit the La Ira de Dios web site at: http://www.lairadedios.com. Hear La Ira de Dios at their Myspace page at: http://www.myspace.com/lairadedios.